Reports from Zimbabwe indicates that Robert Mugabe has negotiated for Grace, his wife, to leave the country while he prepares to step down. Solidiers indeed have the President and his Presidential guard under siege. Zimbabweans are urged to stay away from the Central Business District until further notice. The military has seized control in Zimbabwe but has said President Robert Mugabe, in power since 1980, is safe. After seizing state TV, an army spokesman announced it was targeting people close to Mr Mugabe who had caused "social and economic suffering". 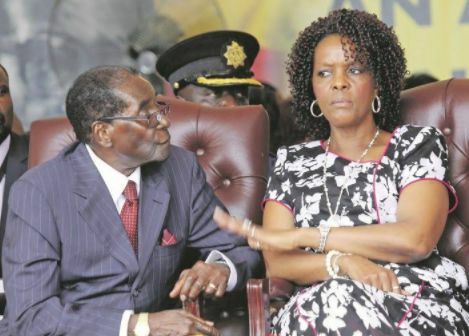 The move came after Mugabe sacked his deputy, Emmerson, in favour of his wife, Grace. Heavy gun and artillery fire could be heard in northern parts of the capital Harare on Wednesday. Mugabe, 93, has dominated the impoverished country's political scene since independence from UK. The UK Foreign Office advised Britons "currently in Harare to remain safely at home or in their accommodation until the situation becomes clearer", while the US embassy in Harare advised US citizens in Zimbabwe to "shelter in place" until further notice. How did the military justify its move? 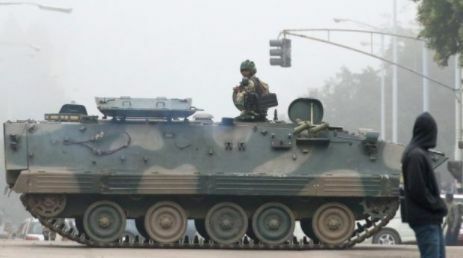 Troops in armoured vehicles have been out in the streets of the capital Harare since Tuesday. After soldiers overran the headquarters of the ZBC broadcaster, Maj Gen Sibusiso Moyo went on air to say the military wished to "assure the nation that his Excellency the president... and his family are safe and sound and their security is guaranteed". Citizens should remain calm and limit unnecessary movement. The military assures the Zimbabwean judiciary that its independence is guaranteed. Security services should "co-operate for the good of our country" and any provocation would "be met with an appropriate response". All leave for the defence forces is cancelled and personnel should return to barracks immediately. What do we know of the shooting? The firing was coming from northern suburbs where Mugabe and a number of government officials live, the BBC's Shingai Nyoka reports from Harare. A witness told AFP it could be heard near Mugabe's residence in the suburb of Borrowdale early on Wednesday. Some staff at ZBC were manhandled when the soldiers moved in, sources told Reuters. Has anyone been detained? A government source told Reuters that Finance Minister Ignatius Chombo had been detained. Alex Magaisa, former adviser to Zimbabwean opposition leader Morgan Tsvangirai, told the BBC: "They have decided not to call it a coup because they know that a coup does not sell, it will be condemned."